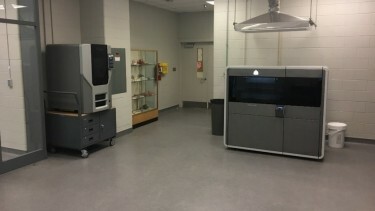 The CEAS Digital Fabrication lab is a University service center providing 3D printing support to undergraduate design curriculum, graduate research work, faculty, staff, the UC Medical Center, and Cincinnati Children’s Hospital Medical Center. Limited support for local industry and entrepreneurs is also provided. High volume areas include medical device printing, lab device/apparatus printing, aerospace research components, electronics housings/shells, and patient specific organ model printing for surgical planning and practice. The lab is run by student 3D printing technicians from all CEAS majors with over 40 alumni since inception. Normal turnaround time for internal work is 3 – 4 business days dependent upon queue volume. If possible, we will make every effort to complete your work sooner.